An exam and test are performed to identify the cause of your current health issue. When you first come to our office one of our staff will greet you and provide some brief paperwork to complete so we can set up a file for you. If you have any tests results you want your chiropractor to see (ex. x-rays, CT or MRI) please give them to our staff at this time or they can have you sign a release and order the results directly from the facility that took them. Typically within a few minutes our trained staff will bring you to a room where a brief test is performed before the chiropractor meets with you. This is important as the results are most accurate if done before any other tests are performed and, like your family doctor does your blood pressure to see how your heart is doing, this test tells your chiropractor how much stress is on the nervous system. For this test men and women are asked to put on a gown having removed tops, bra and chains. 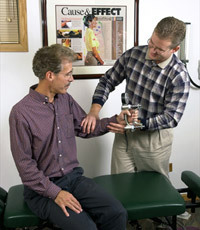 Most other tests your chiropractor will perform can be done with loose fitting clothes so please dress comfortably. Our staff will then bring you to a consultation room to meet your chiropractor. He or she will spend the time to discuss your current health and any areas that concern you. A thorough exam is often required to determine what the best course of action is. When a specific problem is easily identified recommendations for care may be made this day (this includes any need to refer for other tests or to other professionals). If additional information is required (ex. tests result that we order) or x-rays are necessary then they will be requested or performed that day. 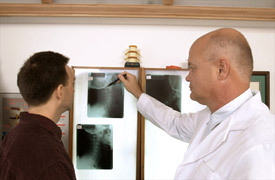 Our x-rays are done on site and when done with your initial assessment are no additional cost to you. After the consultation and exam your chiropractor may need time to develop the best course of action for you. In these cases your chiropractor will ask our staff to schedule a follow up visit as soon as possible to discuss our recommendations. In some cases where a persons pain level warrants it, advice will be given on the use of ice or heat and any other self help remedies that will benefit you before your next visit. On your second visit your chiropractor is prepared to discuss his or her findings with you, explain what they mean and offer solutions. This appointment normally takes 15-20 minutes depending on the number of questions you may have. When our recommendations are clear to you, you will be asked to sign an informed consent indicating your understanding of the care we will be providing. As the type of care that we provide is specific to your needs and varies significantly between a child, adult or senior it is difficult to describe with detail what you can expect. The chiropractors use numerous techniques to best suit you and to ensure the best and fastest results in the most comfortable manner possible. We will always discuss the specifics with your before beginning care. We look forward to seeing you on your next visit. Contact us today to schedule your appointment.